This past week my wife and I had the opportunity to travel to Munich, Germany for Oktoberfest. I’ll have posts on that soon(ish), but I really wanted to get this brief post out soonest, since I know Lufthansa is putting a bigger focus on their Munich hub by launching A380 Flights. I will just say – Munich Airport’s L Gates are not ready for prime time, and that’s where I think most of the growth will be. For starters, if you are flying to the US from Munich via Lufthansa, you go to Terminal 2. Checking in for me at least took a little longer, but I expected this with Oktoberfest still going strong. What I didn’t expect, was that even in the Business Class security screening line–and yes there is one that specifically calls out business class passengers– it took us roughly 25 minutes to get through. Part of it is that the millimeter wave technology they are using seem to be slower, and take up a ton more space, so you get less throughput. The other side was I made a bad choice in that we had a new security screener. Once you get through normal security, you still have to take a train to get to the L Gates. There you go through immigrations officially exiting Germany. Needless to say, you need to pack some extra patience. There’s still a bunch of construction, as you can see, which limits the amount of immigration booths they can open–though in full disclosure, they had less than half open when we first arrived. Overall, the situation was less than stellar. A couple of week ago, American Express announced that they had worked out an arrangement with Lufthansa for American Express Platinum and Centurion card holders to gain access to their lounges in Munich. This arrangement meant that American Express Platinum holders could gain entry into the Lufthansa Senators lounges, and Centurion card holders could gain entry into the Lufthansa First Class lounges. Lufthansa has a Business, Senators and First Class lounge in Munich Airport’s L Gates. We obviously didn’t have access to the First Class lounge, but opted to gain entry into the Senator’s lounge, really, just because we wanted to test the American Express Platinum access. Unfortunately, it took 5+ minutes for the person at the front desk to figure out how to provide us access to the lounge. It even took going to a colleague within the lounge to figure out the necessary codes to enter in the computer. I’m not even sure I understand why it took all the effort. A final note is that there is an additional screening area, that looks like a “lite” version of the US Pre-clearance area of Dublin or Abu Dhabi airports. The gates for US bound flights are segregated with a separate security screening area. I wonder whether Munich may be trying to get on the US Pre-Clearance list. Overall, I was rather unimpressed departing Munich Airport’s L Gates. I totally get that Oktoberfest is a rather busy time of year for them, but as the photo above demonstrates, they were rather unprepared. I suppose I would understand that, if such a busy time of the year were a surprise, but, alas, Oktoberfest is on the calendar years in advance. Overall, I’d advise against choosing Munich as your point of departure from Europe back to the United States. I realize that it may be new and exciting, as Lufthansa begins flying A380’s from Munich, but it may be a lot more pain than its worth. @JohnnieD – I haven’t been to Berlin, though I’ll definitely manage my expectations when I do get there. Having just connected via MUC also, it’s worth noting that the “H” gates also require similar wait times and additional US security screening. It may not be perfect, but in my opinion, still a lot better than a lot of other European hubs! @Becky – thanks for sharing – were the “H” gates also under construction though? I felt the signage was one of the biggest challenges, considering the construction. 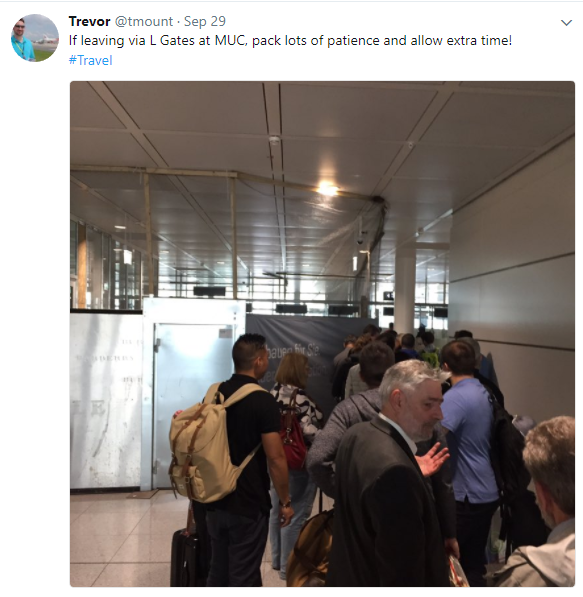 I flew back from MUC on 9/18 (after Oktoberfest as well) and encountered the same situation. I almost had to decide about getting my VAT taxes back vs boarding immediately, which had already started. Ended up getting the tax back with enough time to spare.